Whether you are a railroad enthusiast, a history buff, railfan, or just want a stylish baseball hat to protect your head from the elements…. Our Baltimore & Ohio Railroad hat fits the bill! Wearing this hat will transport you back to the locomotive, putting you in the Baltimore & Ohio Railroad engineer's seat. Our one of a kind Baltimore & Ohio Railroad baseball style hat comes adorned with a Baltimore & Ohio Railroad embroidered patch. 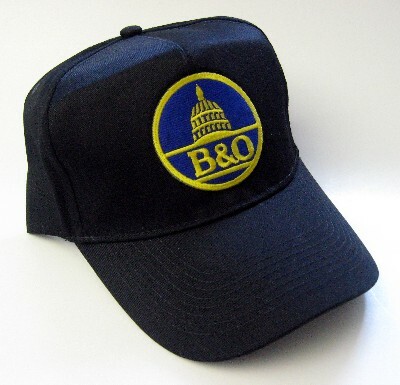 This black Baltimore & Ohio Railroad cap is made of 65% Polyester 35% Cotton blend, and has an adjustable plastic strap for one size fits most for a comfortable fit for years of use. We have photographs and slides of the Baltimore & Ohio Railroad available for sale in our photo shop.